My first book, the Bradt Guide to Venezuela, came out at the end of December, but due to the Christmas rush it took a while to get out to high street bookstores like Waterstones and W.H. Smith and was constantly selling out on Amazon.co.uk due to unexpected demand. So imagine my surprise and delight when I walked into my local branch of Waterstone's on Broad Street in Reading this morning and found a copy on the bookshelves, wedged (ironically?) between guides to the USA and Vietnam. It's every author's dream to get published and see their work in print and I freely confess that it was a magical moment when, after months of feverish writing, editing and fact-checking, the finished book dropped through my letterbox in December and I could finally hold it in my hand. However, nothing prepared me for the rush of blood to the head when I saw my humble guide to Venezuela in the travel section of Waterstone's. So thanks to all the super-friendly staff at Waterstone's for humouring me as I snapped away like a Japanese tourist and posed the book around the store as if it was a supermodel, because it really did make all the hard work and frantic travelling and sleepless nights worthwhile. The whole point of the exercise is to try and raise Venezuela's profile as a tourist destination and provide travellers with all the information they need to get the best out of their trip to this fascinating and beautiful country. Readers of the book should have all the information they need to master some basic Spanish, learn something about Venezuela's history, music and culture and be able to succesfully organize a trip Angel Falls by canoe, mount an expedition to Mount Roraima or simply spend a week basking in the warm crystalline waters of the Los Roques archipelago. 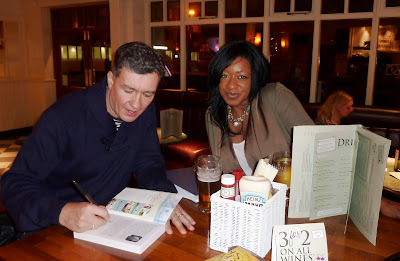 Earlier in the week I had my first ever book signing, writing a short dedication for Jorge Franca, a good friend who has been a keen supporter of the blog and the book for some time now. Russell... you're looking quite old, in that last photo holding the book!